Bookabi – Create books in 2D or 3D with backgrounds, characters, objects, stickers or your photos. Call outs for text. My Pictures Talk – Create stories with your photos and audio recording features. Storyboards – Create 2D story boards with stock images. Creative Book Builder – Create ePub books or text books. Work flows to PDF, ePub and iBooks. Ready to Print – Allows customization of features within the pre-writing activities. Visual Impact Pro – Video, text, audios supports provide cognitive supports for community and daily living tasks. Bitsboard – Combines many Grasshopper apps for customizing instruction for emergent learning tasks. Sentence Maker – Create your own sentences for students. Make a Dice – Create your own dice for classroom tasks. 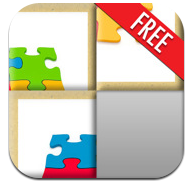 Little Puzzles– Use your own pictures to customize puzzles with 4-9 pieces. Tiny Tap – Take pictures and create choice game for young students. Word Slapps – Customize and categorize vocabulary with images, audio. Teaching Table – Provide a variety of widgets to create math activities. Sosh – Provides supports for 5 R’s of social skills and self-regulation (relate, relax, regulate, reason, recognize). Appropriate for individuals with self-awareness. Sosh Relax – Relaxation component only of the Sosh app. Add your own images, sounds, songs to create customized self-regulation tool. Autism 5 Point Scale – Five point rating. Allows customization of each point. Write My Name – Features ability to create customized user name activity. Write for School – Choose school fonts. Customize the instruction and verbiage of letter formation within app. Another fabulous resource is Lauren Enders Pinterest pins of customizable apps. Lauren’s Pinterest is absolutely awesome! An exceptional resources for special education teachers, therapists and AT’s. Also thank you to Lisa Olsen for sharing her favorite customizable apps! What are your favorite apps that can create customized content for your students or clients occupation? This entry was posted in App Reviews, Apps for OT's, Apps for Special Needs, Customizable app, iPad, iPhone, iPod, Life Skills, Occupational Therapy, Rehabilitation, Social Skills, Special education and tagged Activities of Daily Living, App Review, App Review sites, iPad, iPhone, iPod, occupational therapy, OT Apps, special education, special needs students. Bookmark the permalink. I agree, great for high functioning individuals needing a structured visual list!